I took this picture from a bench while I watched the children splashing in the pool. The scene above looks so idyllic. It just harkens you to want to sit down and just relax. Complete with a cup of coffee, a sleeping toddler and another little running around in the water, splashing around. This was from yesterday and if I scroll through my pictures on my phone, I can tell you that I would have a hundred more photos of the same scene. It has been a hot summer. 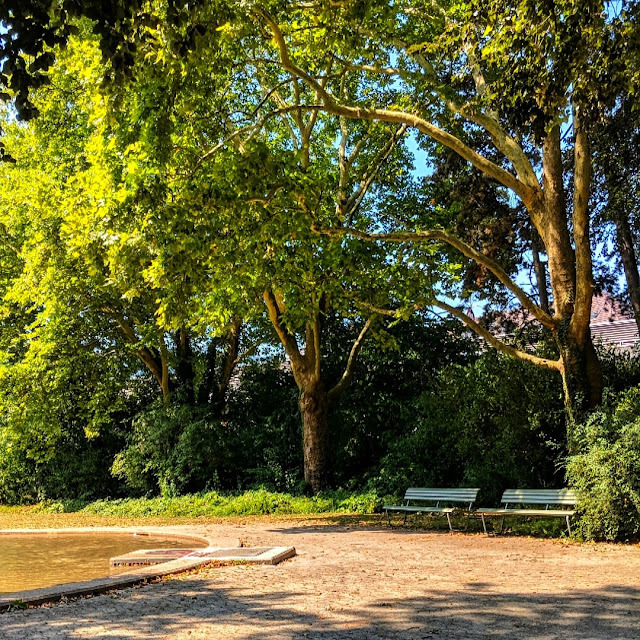 We're currently in Zurich and temperatures have been lurking at 33C, give or take. This is actually the first time I've visited Europe during the summer - I'll know for next time! We've always visited during the fall or winter season. So, what have we been doing to beat the heat? Head to the water - we've been doing a lot of that. The picture to the right was on our ferry ride to Verkehrshaus on Lake Lucerne. Look out for that post soon! The day we went to Lucerne, was Swiss National Day, and it was actually one of the slightly cooler days in Switzerland with rain forecasted later that afternoon. It did rain later that day. It also felt refreshing despite feeling sticky. The littles and I have also been ending our days just by wading in the splash pool in the local park next to us. It's been a great way to relax after a long, hot day and also a great way for them to be introduced to other children, who speak a different language, and learn how to navigate a new world. It always amazes me how children can easily play with each other and find common ground even when they don't speak the same language. We've been teaching the littles some basic greetings so that they can get pass the first hurdle. Drinking fountains!!! Zurich is one of the places in Europe, where you can find many drinking fountains around the city. This picture to the right is of one right outside Zoo Zurich. The water is cool and feels refreshing. The littles had a great time looking for all the fountains strewn all over town during one of the our walks over to the city center. We've seen fountains in the styles of dragons, statues all over. It made for a fun game to look for them - it also made it easier for the littles to walk all over town when they had a mission to complete. Head to a Badi. These are public pools that you can swim in, around Zurich, to help cool down. Some badis offer free entry while others charged you CHF 8. Bathing in the river or lake is a culture, over here. You can read more about badis here. With a Zurich card, we were able to take advantage of many indoor activities from taking in sites at the Paleontological Museum at the University to taking the Dolderbahn up to Dolder Grand. The view of Zurich is amazing! Head to a shopping mall or the main train station. 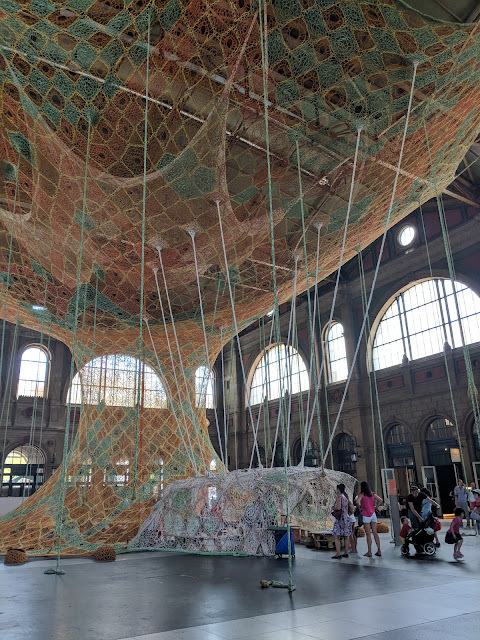 The Zurich Train Station has an installation by Ernesto Neto, "The Gaia Mother Tree." You can go inside the installation, no shoes, and just lounge inside of it. How about you? What have you been doing to help cool off?